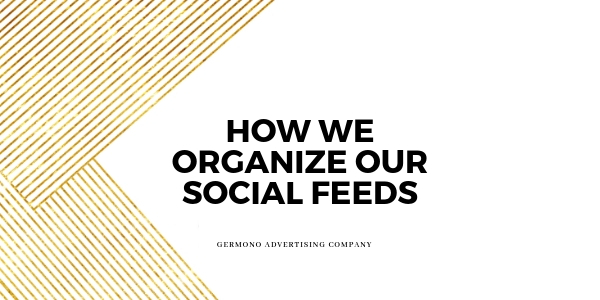 Did you know that here at Germono we average handling anywhere from 16 to 20 account feeds at a time?? With that being said we KNOW you have what it takes to get organized with yours! Lucky for you, I’m here to tell you EACH and EVERY step we take. So grab your coffee and read along! STEP ONE: Create an account via websites like Basecamp, Asana, or Google Calendar for organizational purposes. We use Basecamp for most of our accounts. (So, we’re pretty biased. *wink*) In our opinion, this project managing website is the most user friendly. These programs help you lay out the months ahead without becoming disorganized. Each day of the month has it’s own “portal” where communications can be made about that certain event. This ensures that you and your team are always on the same page! This is by far the most important step. Without the time, you are setting yourself up for failure. Keep reading to learn how much time each step takes us. Once you have your calendar ready to go, start brainstorming. What events does your company have coming up? When do you want to start promoting your event? What holidays are on the calendar? After you figure out the bigger focuses, lets think about some other ideas you want to share on your feeds. This could be a staff feature, a weekly quote, etc..
You might be asking…”wait, what about the verbiage?”. Everyone works different. We are more visual individuals and we find it easier to see an image and grasp verbiage from it. Our advice? Figure out what works best for you. There’s no right or wrong way. YES. It takes THAT long…sometimes even longer! Once you’ve created verbiage, check with your team for grammar and spelling errors. Being prepared is never a bad thing. You can choose to post manually every day for your feeds if you wish, however, what happens when technology fails? What if you have an emergency and aren’t available to get to your feeds? A missed post is a missed opportunity. To schedule, we like to use Hootsuite. Again, we are partial to this program so don’t let our opinion hinder your decision. There are other websites such as: Sprout Social & Sendible. You can add all your social media platforms for easy access. We recommend scheduling Facebook posts through the Facebook platform. Did you notice the time stamps? It takes us on average about 10 – 12 hours to get things rolling for the month and remember we’ve been doing this for quite some time now. Also note that these time frames don’t include the time it takes for revisions and approvals. If you just realized that you MAY need a little help getting organized, that’s what we’re here for. From social media consulting to full blown social media take-overs, we’re your girls! Drop me a line with any questions, or to just simply say hi at cali@germono.com.